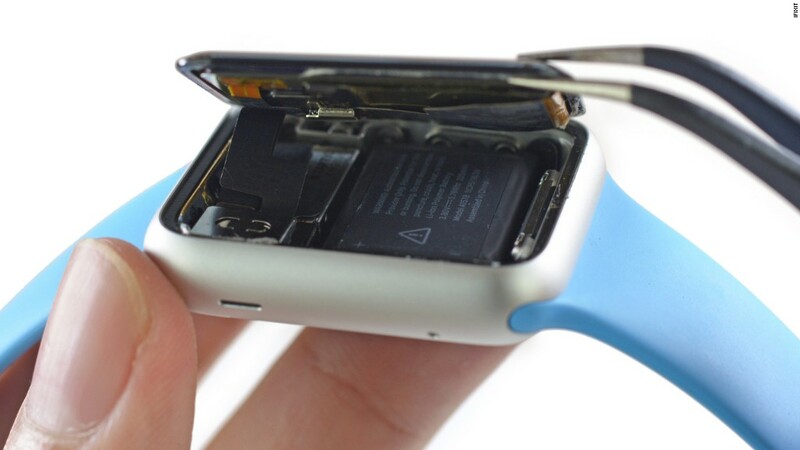 Has interest in the Apple Watch dipped? According to one estimate, yes. Slice Intelligence collects information through e-receipts from a panel of 2.5 million online shoppers in the U.S., who have permitted access to their inboxes. The data provides a glimpse into purchasing trends. On April 13, estimated daily orders online for the Apple Watch were just under 35,000 in the U.S., according to Slice. About two and a half months later, on July 1, Slice estimated sales were about 2,500 that day -- a 90% drop. The launch momentum is always higher so the graph excludes the surge sales on the first day. 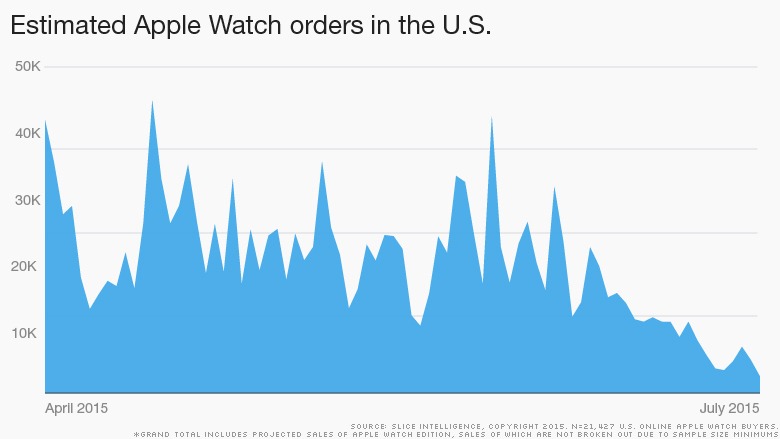 Upon its simultaneous release in nine countries on April 10, the Apple (AAPL) Watch was back ordered till June in many locations. In the U.S., Slice estimates that over 1.3 million units of the Apple Watch were pre-ordered on the launch date. The data shows that the Apple Watch Sport sold better than the Apple Watch and the Apple Watch Edition, but all models saw a sharp decline in sales. The Slice data is likely to show only part of a much bigger picture. Possible blind spots in the data include in-store sales, paper receipts and data from people who are not participating in the Slice panel of online shoppers. "What people are assuming is a decline, is really just a normal launch cycle in consumer markets. We continue to see strong demand and interest in large markets like China, and expect Watch demand to grow even stronger by the end of the year," said Ben Bajarin, principal analyst at Creative Strategies, told CNNMoney. Is this the end for the Apple Watch? Trip Chowdhry, Managing Director of Global Equities Research, had estimated that Apple Watch sales will reach 5 million this quarter. Chowdhry is confident that Apple will still make that figure. He also agrees the slowdown is a phase. People will play catch-up soon, he said. "What is happening right now is people are evaluating. The real catalyst will come after September," Chowdhry told CNNMoney. He estimates that 20-25 million Apple watches could be sold by the end of the year, as people see others using it. There is no indication of how the Apple Watch is faring in the 15 other countries beyond the U.S. market. Many Android and Windows users are making a switch to Apple but don't want to splurge on two products at once, according to research by Chowdhry's firm. This is based on the fact that people are buying an iPhone today in anticipation of buying the Apple Watch around September or October. The bigger picture will be more obvious if Apple unveils their own figures, but they probably won't announce Apple Watch sales unless the numbers are very good. The earnings report for Apple's third quarter will be released on July 21.